Amy’s Breakfast Recipe | Is Life a Recipe? How good does that look? Nice right! Inspired by my mate @Mark Mottram, of Bakery & Bar. Amy’s Breakfast Recipe today came out of the blue, after having had a look in the fridge at what’s on offer. 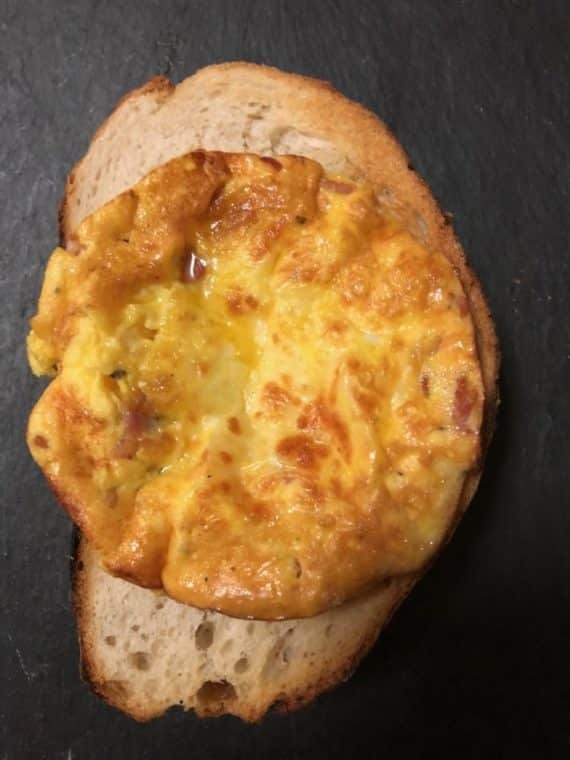 I ended up with this Frittata come Omelette, served in a bread ‘plate’. I took a big two inch deep slab of Mark’s sour dough bread. I then used one of my food stacker rings to cut out a circle in the middle of the bread – don’t cut all the way through, as this is literally and edible bowl. A quick whizz in the toaster to fir, it up. Get a few pieces of streaky bacon and cut them in to small pieces. Get that on the heat until nice and crispy. Now take 2 eggs, crack them in a bowl and whisk away until all nicely mixed together. Add in some double cream and whisk again. Give a good sprinkle os sea salt and pepper. Stir in some grated mozzarella and again stir it all through. Pour that in to a metal handled pan and pop it in the oven on 150, until it puffs up and is nicely browned, as in the picture. Serve that up in the hole you made in the toasted bread – and there is Amy’s Breakfast Recipe. I finished it off with a little sprinkle of Truffle salt. BOOM! Pretty simple right, and how good does it look and taste. Absolutely delicious according to #1 daughter. Amy’s Breakfast Recipe was a roaring success. To be honest its just an omelette, that was jazzed up by baking it, using that rather original serving platter. Give it a go, I guarantee the kids will love it – and you too would also – ENJOY!!! No Replies to "Amy's Breakfast Recipe"